TACOMA — Oh yeah, U know it. And now, U owns it. 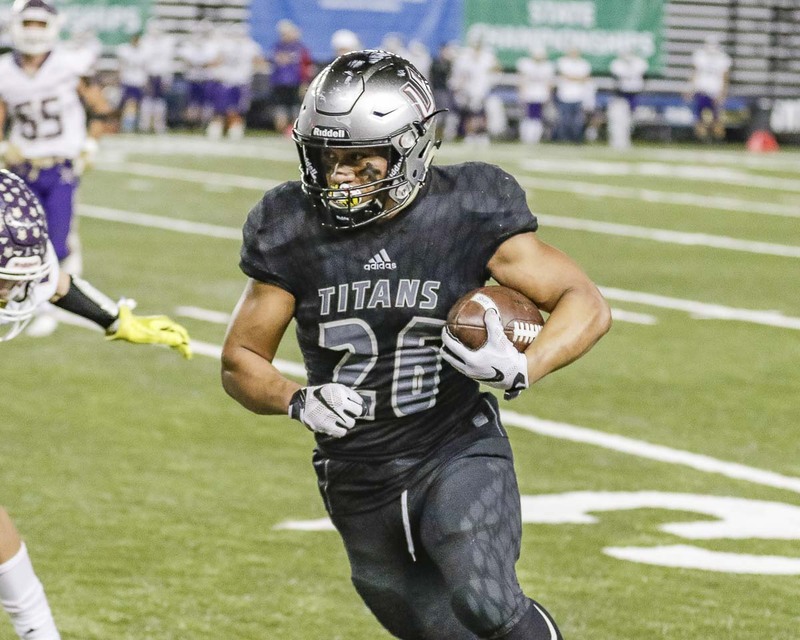 The Union Titans won their first state football championship Saturday night at the Tacoma Dome, scoring the final 38 points to pull away from Lake Stevens 52-20. 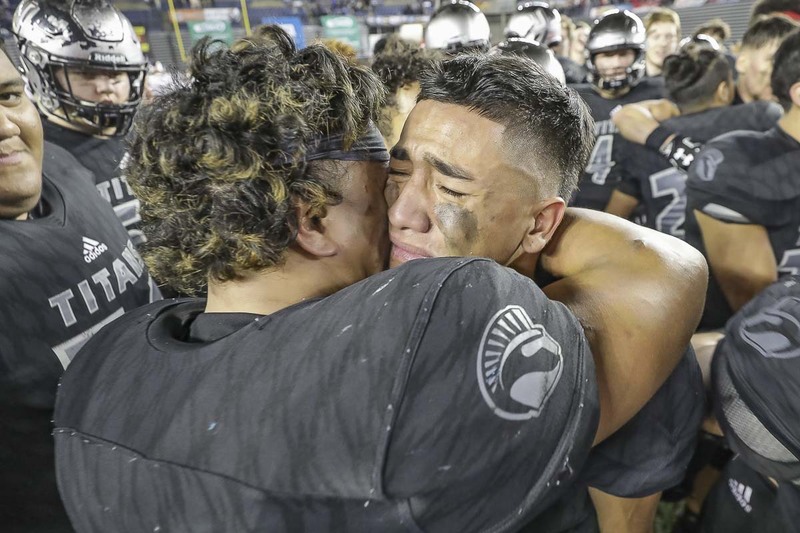 Jojo Siofele had the game of his life with four touchdowns and 292 yards from scrimmage, and Lincoln Victor, the heart and soul of this team, threw for 327 yards and five touchdowns as Union completed a 14-0 season to win the Class 4A crown. “So surreal. I’ve been dreaming about this since I was a little kid,” Victor said. The Union defense shut out the Vikings in the second half, allowing the offense to do its thing. “I’m in shock. I’m in awe,” said Jackson Saylor, another senior on that defensive line. Lake Stevens had scored three touchdowns in three possessions during one stretch of the first half. He did. So did his teammates. And together, they put on a performance worthy of a championship. Union held a 24-20 lead at the half, and then it was all Union in the final two quarters. Siofele caught a 56-yard touchdown pass from Victor to make it 31-20. 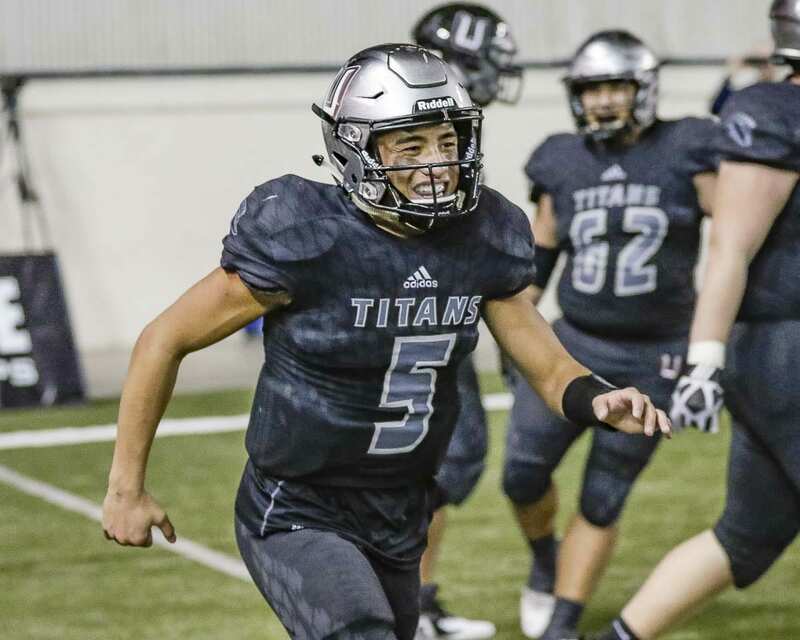 The defense got the ball back, and the Titans drove the field and scored on a 10-yard pass from Victor to Siofele to go up 18 early in the fourth quarter. The defense got another stop, setting up another score. Alex Vallejo and the Titans faked everyone out when Victor rolled right and Vallejo sneaked out to the left. Wide open. Touchdown Titans. Siofele finished the night in style. One, he preserved the second-half shutout by intercepting a Lake Stevens pass in the end zone for a touchback. On the next play, he broke free for an 80-yard touchdown run. Siofele finished with 10 catches for 179 yards and three touchdowns, plus he rushed for 113 yards and a score. It was by design, too. Another dude, Darien Chase, set the tone early for the Union offense. He had five catches for 126 yards, all in the first half, plus a touchdown. This coming after he missed most of the semifinal game with an injury. The first half featured five lead changes when the Union defense tried to figure out the Vikings. Lake Stevens scored first but missed the extra point. Victor found Chase on a 20-yard touchdown pass on a two-play, 71-yard drive. Then Nile Jones scored on a 3-yard run to make it 14-13 Union. Less than two minutes later, another Vikings touchdown. No problem for Union. Siofele caught a 23-yard TD pass from Victor. Lake Stevens would be shut down the rest of the way. The Titans got into position for a 34-yard field goal by Alex Koga on the final play of the half for a 24-20 lead. The rest was Union history in the making. 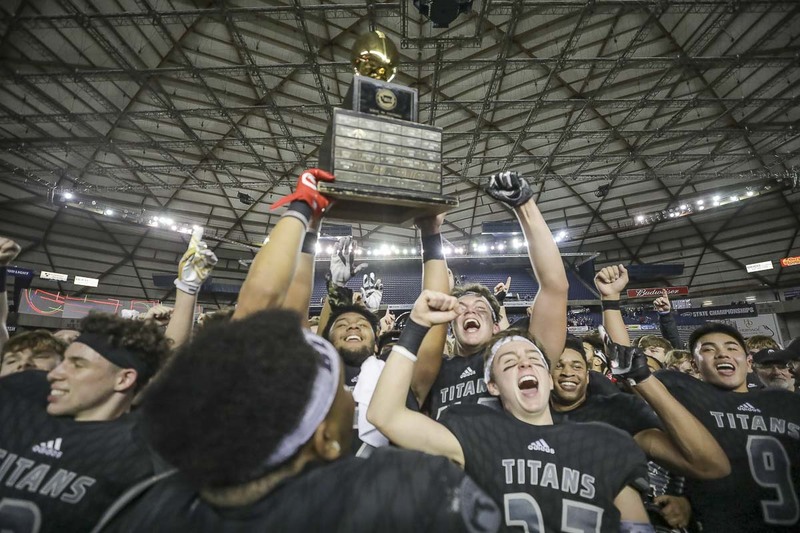 The Titans are on top of Class 4A football in the state of Washington. RUSHING: Siofele 5-113, N. Jones 7-44, Victor 8-40, Isaiah Jones 5-31, Alishawuan Taylor 1-3. RECEIVING: Siofele 10-179, Chase 5-126, Vallejo 2-12, Taylor 1-15, Victor 1-(minus 5).